Sometimes simplicity isn't as simple as it seems. 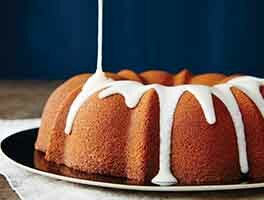 Striking the perfect balance among flavor, texture, moistness, and appearance can be quite a challenge when you're making a plain yellow cake. But when you do achieve that balance — you're golden! 45 mins. to 58 mins. Preheat the oven to 350°F. Lightly grease an 8" x 2" square pan; or a 9" x 2" round pan. To assure crumble-free removal of the cake from the round pan, line the pan with parchment. Stir together the flour, sugar, baking powder, salt, and Cake Enhancer in a medium-sized mixing bowl. Bake the cake on your oven's middle rack for 35 to 38 minutes, until a toothpick inserted into the center comes out clean, and the center of the top springs back when pressed lightly with your finger. Remove the cake from the oven, and place it on a rack. After 10 to 15 minutes, loosen its edges with a table knife or spatula; and carefully turn it out onto a rack. Peel off the parchment, and turn it right side up. Let the cake cool completely before serving. 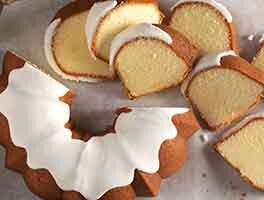 Serve plain; sprinkled with confectioners' sugar, or spread with your favorite icing. Yield: one 9" round single layer or 8" square cake, 12 to 16 servings. 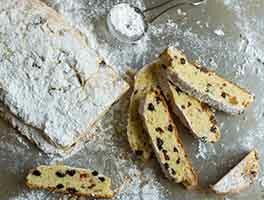 Can you use King Arthur Unbleached All-Purpose Flour in place of the cake flour? Yes. Your cake will be a bit denser/coarser, but just as delicious. Can you double this recipe to make a layer cake? Absolutely. Double all of the ingredients, and bake in two 9" round (or 8" square) pans. The optional lemon juice and almond extract don't add discernible almond or lemon taste; but simply enhance the cake's overall flavor profile. Why the range for salt? Each of us has our own personal "salt tolerance." If you're someone who doesn't bake with a lot of salt, use the lesser amount; if you find you generally prefer things saltier than less so, use the greater amount. This cake is tall enough that you can split it horizontally, to make top and bottom layers; then add filling and topping/icing. It's a good candidate for Boston Cream Pie; simply fill with vanilla pudding and top with chocolate ganache. If you're trying to avoid butter, substitute 1/3 cup vegetable oil for the butter, if desired. Absolutely awesome cake! I split the layer, filled it with lemon custard and topped it with fresh sweetened strawberries. The cake was moist, fine textured and delicious. 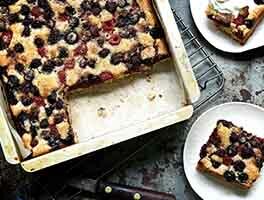 Plus very easy to make; I will save it to my favorite dessert recipes. Baked this cake to use for cake pops and it was perfect! I mixed it by hand. I didn't have cake flour so took a tablespoon of APF out and added a tablespoon of potato starch. I also added a tablespoon of cultured buttermilk powder to the dry mixture and skipped the lemon juice. I reduced the sugar by 1/4 cup since I used the cake for cake pops and didn't want them too sweet. I can't wait to bake it again as a regular cake! It rose to completely fill my 8 inch cake pan so would be great split and filled. Texture was light and moist but sturdy. Good crumb, perfect for berries and cream tonight, everyone loved it. I did switch out milk for buttermilk and it was very good! I will be making it again. Easy no fuss cake. I made it and then served it like strawberry shortcake, split each piece and loaded it with fresh whipped cream and berries. I will be making this again for simple birthday cakes. This cake turned out so good! I skipped some ingredients like the cake enhancer, almond extract and lemon juice and it still turned out excellent. The only thing I added extra was 1/2 a cup of boiling hot water right in the end, to the batter because it really makes cakes more fluffy and spot on, the end result was so good. I baked it in a round pan for about 55 minutes at 350. This is the most delicious, moist and easy plain cake I have had. It's going in my recipe book. Thank you! This cake is great. Very quick and simple to assemble and bake while the outcome is perfect- moist, flavorful and satisfying texture. More than likely you already have everything you need in your kitchen. With the exception of not adding the cake enhancer, I followed the instructions as written. 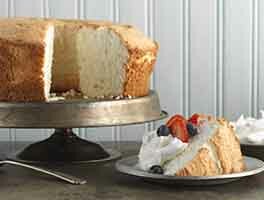 The size is great too, perfect for a mid-week dessert or to take to a potluck. I see myself making this often! 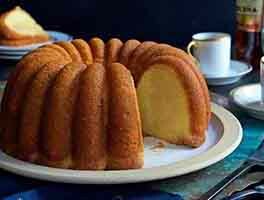 I thought this was great and my new go-to for a yellow versatile cake. I experimented a little by putting all the ingredients at once into a food processor and blitzing for about 15sec. It was so fast and perfect! I poured into a circle cake pan and banged it a little to get out any big air bubbles. It was perfect: tender crumb, moist, full of flavor (I did extracts plus the lemon juice). I brushed on a simple syrup of melted jam and let cool before putting on a simple chocolate buttercream (which I also made quickly in the food processor). Bakery level cake, quick! Thanks! This has become a go-to favorite for birthdays and any excuse to bake a cake! I doubled batch and baked in an 11 1/2 x 17" sheet pan. I took another baker's advice to reduce the cane sugar by 25% (used ~3/4 cup or 5.25 ozs) and had nice flavor, texture, and golden color. I mixed everything by hand. This truly is simple and good.